Since I started teaching last January, I have struggled with how to manage both my Reading and Math Centers. For a long time, I just went with your typical center rotations that were timed for 15-20 minutes each and the students rotated through them over 2 days, but I was never truly happy with how they were working. I felt like I wasn't getting enough time with some of lower groups and that some students (who really need the practice that center activities offer) just were not getting enough time to finish the work at each center. I spent months trying to come up with alternatives that would work with my group of students, who had a hard time getting assignments done. What is Must Do May Do? 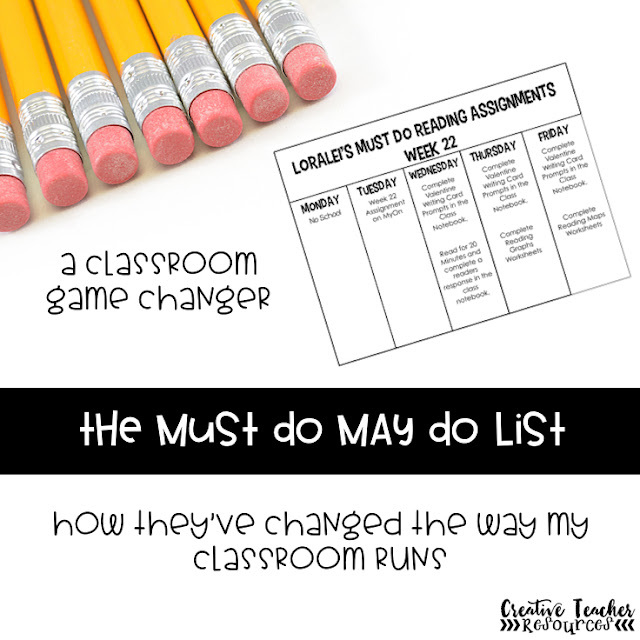 Finally one day I was scrolling through my Instagram feed and saw a post from Peppy Zesty Teacherista about how she uses an idea known as "Must Do, May Do" for her centers. After reading her initial post about it, I was hooked (You can find the post I am referencing here). It sounded and looked like the perfect solution for my classroom. It would allow the students to work at a pace that worked for them and gave me the freedom to meet with my different levels of groups for different amounts of time! I introduced and implemented this idea the next week in just Language Arts to see how it would go. For the most part it went wonderfully and exactly as I had envisioned it going. The only problem I had was with a few friends who seemed to be unable to get started at all because they really needed to be told to do an exact assignment each day. I realized they needed to use more then the template from Peppy Zesty Teacherista to be successful during center work. So I created a Modified Must Do, May Do List. It has all of the same assignments on it as the general students list does, but tells them specifically which one to do on each day. It also does not show them the may do tasks, so they stay focused on what I actually want turned in. I also strategically have them all on different activities each day, so they are not all together (because these students are typically distracting each other from working). The sheet is personalized with their name on top, so they know it belongs to them. After two weeks of using this in Language Arts, I implemented it into my Math Block as well and it went very smoothly as well. I just love the flexibility I have to meet with groups and individual students now. The one adjustment I have made is now also posting all of the Must Do assignments as a list on the board. 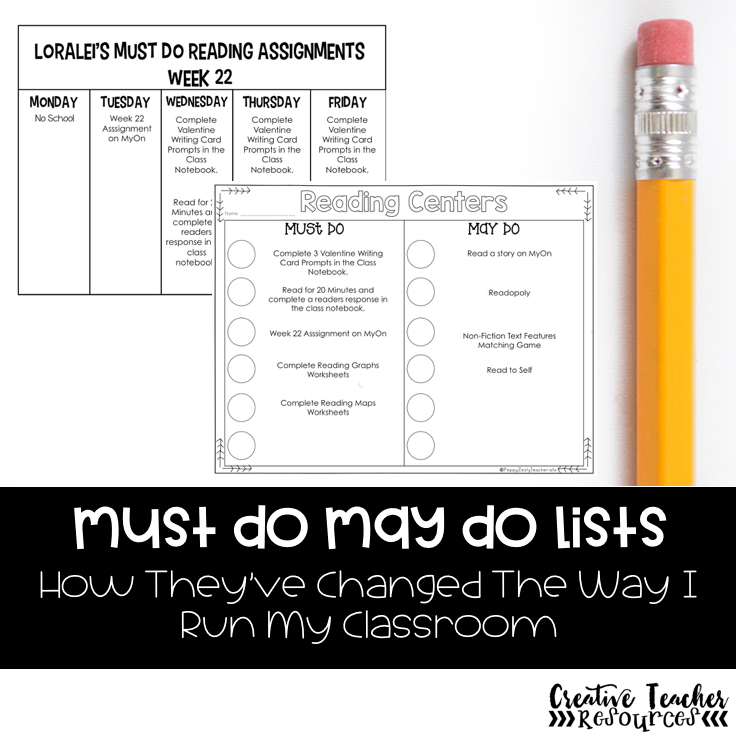 I do this because I was getting tired of reprinting so many copies of the Must Do May Do lists, because my students would constantly misplace their copy of the list for the week. Now if they loose it, they can just reference the board to see what all they can be working on. I project these lists using Teach Create Motivate's timer slides. In the next section, I will let you know why I use slides that have timers on them. So you may be wondering how I fit and use the Must Do May Do concept in my day. I now use it for both Language Arts and Math. For Math I have about an hour total for my block. I will use the first 10-15 minutes introducing a new concept or reviewing new content that is being taught throughout the week. 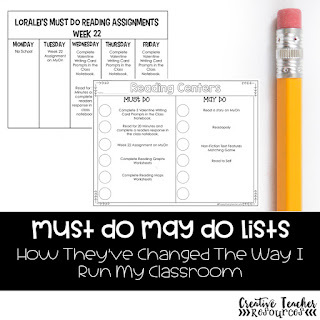 On Mondays, I use the next 10 minutes introducing the tasks on the Must Do, May Do list and giving directions on where to find the supplies and where to complete and turn assignments in (i.e on paper, in our online classroom notebook, their math journal, etc). After that the students get to work on the first assignment that they choose. On Mondays they have about 35 minutes to work on their tasks and then Tuesday-Friday they have between 45-50 minutes each day to work on the tasks. During that time I try and fit in at least 2 groups of students each day for about 20 minutes each, but the number varies dependent on the skill level of the groups I am meeting with. It is a similar set up for Language Arts. For my L.A block I have about 75 minutes. I use the 1st 10-15 minutes to do a read aloud/introduce a new concept/review content that we are going to continue working on. Then just like Math I take about 10 minutes on Monday's to introduce and give directions for each task on the Must Do List. Then they use the 50 minutes we have left to get started on their tasks. On Tuesdays-Friday's they have about 60 minutes to work during Language Arts. For both Math and L.A I have slides (that have all assignments listed on them) with timers projected. I have the timers running for 20 minutes and then starting over again. I do this to give the students a heads up about how much time has passed and that it may be about time that they should be working on another task. No task I give to them should really take them more then 20 minutes to finish unless they are a very low student. The timers make a quick chime signally that it has been 20 minutes. If we have a lot of testing or something else going on during the week, I will give the students extra time to work on their tasks during our RTI time if they are not being pulled for a group. What are my students doing during Must Do, May Do time? You may be wondering what my students are doing during this time. My students have many different tasks they can be working on. Listed below are the typical assignments I give to them each week. Every once in awhile I will add in a different assignment if it goes along with the content, but for the most part I like to keep the same types of assignments each week and just change the topic, so my students know how to complete the assignments and what is expected of them. In Math I typically give 5 tasks and I typically give 6 in L.A since we have more time in our L.A block then Math. For the May Do Assignments, I typically have more content based game sites available along with extra reading time, IXL time etc. I pick things that my students think are fun and really enjoy doing in the classroom since it is like an incentive to get all of the required work done first, so they can do what they really like to work on. What am I doing durning Must Do, May Do Time? As a teacher, I really love Must Do, May Do time because of the flexibility it gives me with my time to get done what I need to get done. The majority of my time during it is spent meeting with my groups in Math and Reading. Some groups that are higher I may only meet with for a few minutes to check in and see how they are doing, while I may meet with my lower groups who need more intense interaction and instruction for 20-25 minutes at a time. These lists really give me the freedom to do what needs to get done and doesn't hold me to the amount of time on the center rotation timer. Here is a list of a few other things I do during this time to work with students. From day one of starting our Must Do lists, I have laid out a list of expectations for my students that is posted for them to see on the slides while they are working to remind them at all times of the high expectations I have for them. If I see a student who is not meeting the behavior expectations during the Must Do time, I will call their name and ask them to go and take a moment to go reread the bottom of the board to remind themselves of how they should be acting. Below is a list of the expectations I have for my students when they are working. *Ask the Direction Director and 2 others before interrupting the teacher. *If the teacher calls you to come work with her, go straight to her. Hopefully this post has given you some insight onto how a Must Do list works and why they can be a great benefit to your students and to your teaching. You can find a link below to the individualized Must Do template listed in my store as a freebie. If you are looking for the general Must Do list template I have shown in pictures, it was from the Peppy Zesty Teacherista's post I linked to a few paragraphs up in the post. It is listed as an editable freebie in her post. If you have any other questions about the specifics of using a Must Do list in your classroom, feel free to email me at annahines@creativeteacherresources.com. Anna Hines is a 3rd Grade Teacher in Northern Virginia. She is author of Creative Teacher Resources. You can find her at the following links. Do you have a copy of the Must Do/May Do handout that has the circles on it? It's not featured in the link. You can grab them from the Peppy Zesty Teacherista post that was mentioned!